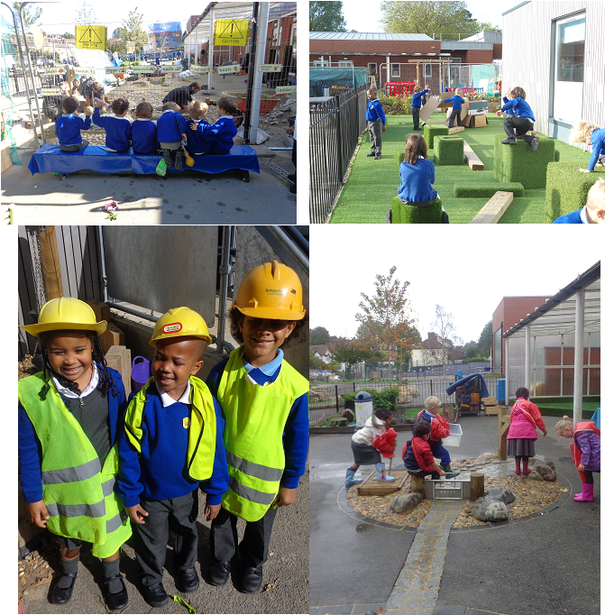 specific areas of the curriculum have been highlighted, we plan for all areas to enable the children to experience a variety of play-based activities during their time in Reception. The children have enjoyed an exciting start to their first year of school. They have been exploring their new environment, both inside and outside. Take a look below to see what we have been up to! Reception have been learning about Traditional Tales and Autumn. We have very much enjoyed reading stories, acting them out and making models of the giant's castle from Jack and the Beanstalk. We have also been learning about the Rugby World Cup. As well as learning about the sport itself, we picked a rugby team each and learnt about the country they come from. Emerald Class learnt about Wales and Garnet Class learnt about Ireland. 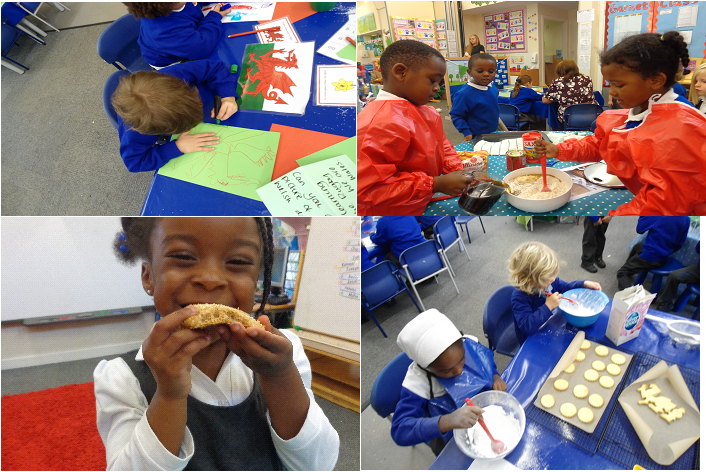 We made Welsh themed biscuits and Irish soda bread. In our outdoor environment, we have been lucky enough to get a fabulous new water exploration area. We really enjoyed watching the builders at work and asking the lots of questions! We have been keeping fit and healthy outside too, climbing and balancing in our gross motor skills area. So far, we have loved our topic 'Food and Festivals'. 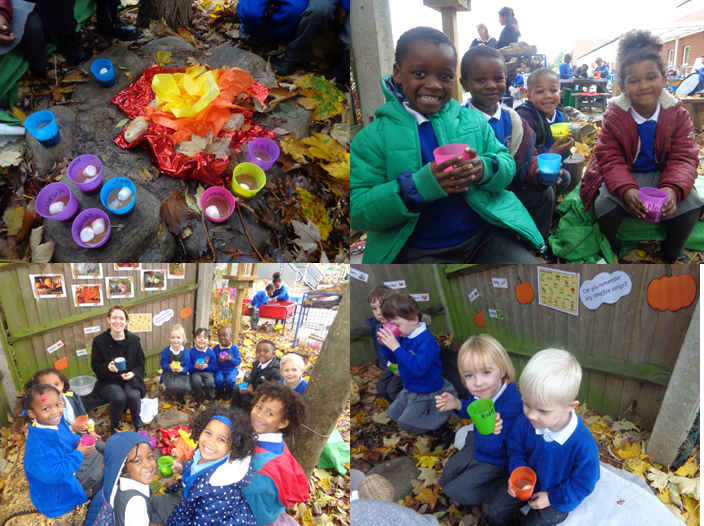 On the 5th November, the children were lucky enough to taste some delicious hot chocolate and ,marshmallows whilst sitting around our camp fire and singing fireside songs. Diwali is another festival that we have learnt about. The children were able to make their own Diva lamps for the 'Festival of Light' and we blended some fresh mango with natural yoghurt to make yummy Mango Lassi drinks. 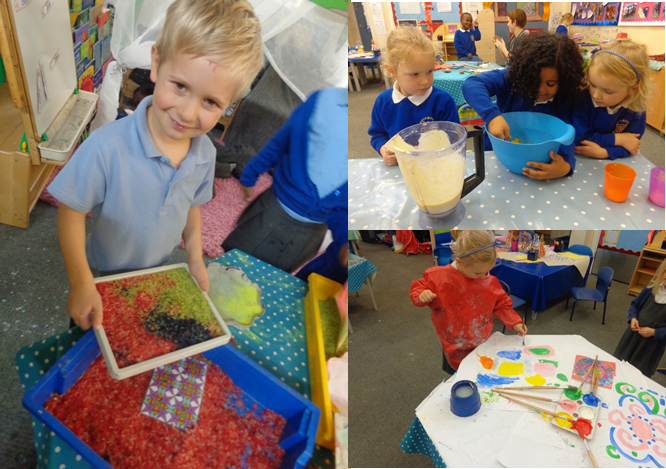 We also made some beautiful Rangoli patterns with coloured rice and sand. As part of our topic we learnt about food from around the world. 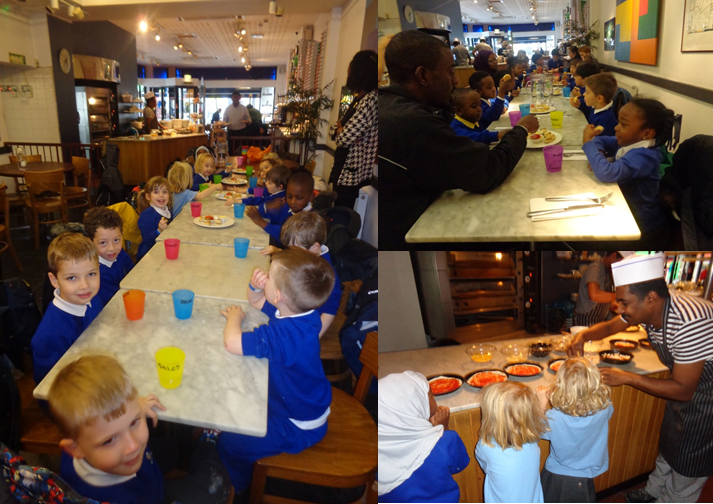 We went to visit Pizza at the Palace to make our own Italian pizzas and were taught some Italian words and phrases by one of Garnet Class's parents. 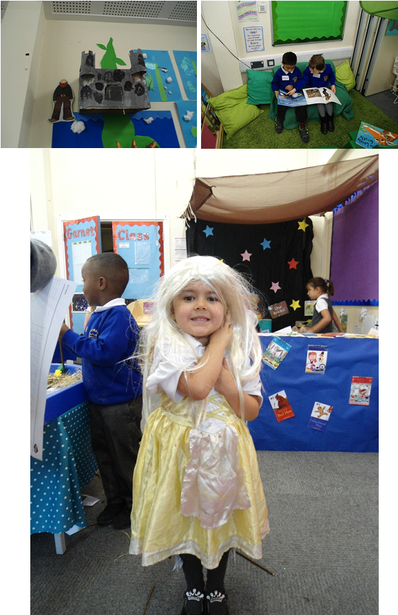 We have now embarked on our Winter Wonderland theme for the final two weeks of term. The children have been learning some festive songs to perform to parents and carers and have made some wonderful tree decorations! During Spring One, Reception enjoyed learning about Heroes. 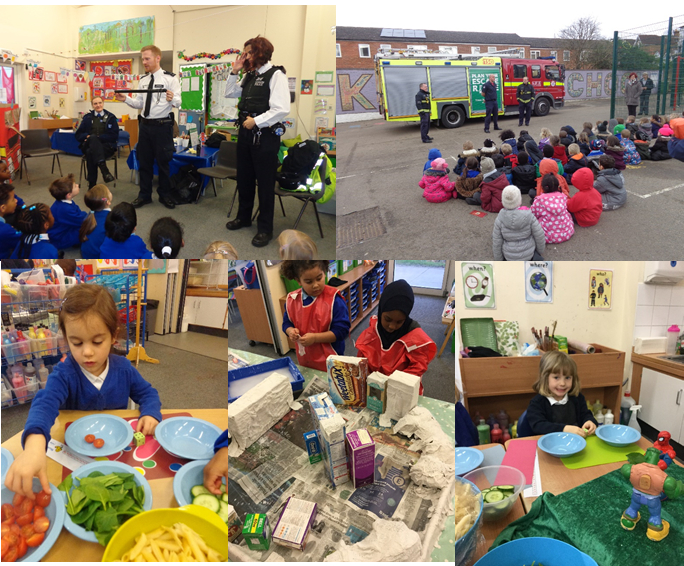 We had some exciting visits from our local heroes; the Police and the Fire Brigade. We used our maths skills combined with cooking to create some superhero salads- you had to double the ingredients to make you doubly as strong! We used our creative and model making skills to create a superhero city using Mod Roc. In second half of the Spring term we learnt lots about Spring and New Life. 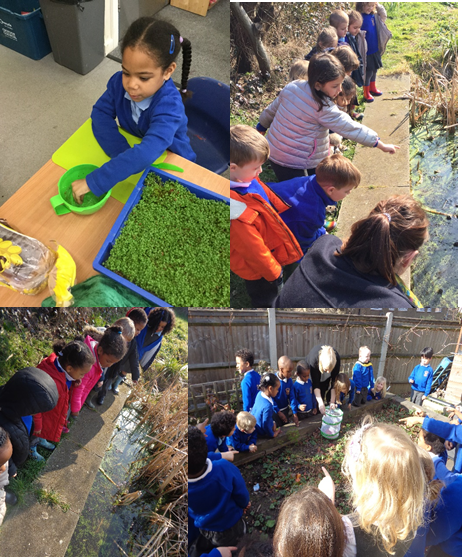 We really enjoyed visiting our pond and were amazed at the amount of frogs and frog spawn we saw- what a great habitat! We also learnt about the life cycle of plants and even grew our own cress to make delicious healthy egg and cress sandwiches. Just before we left for the Easter break, we released the butterflies that we had nurtured since they were tiny caterpillars. It was very exciting seeing them flutter off into their new habitat! 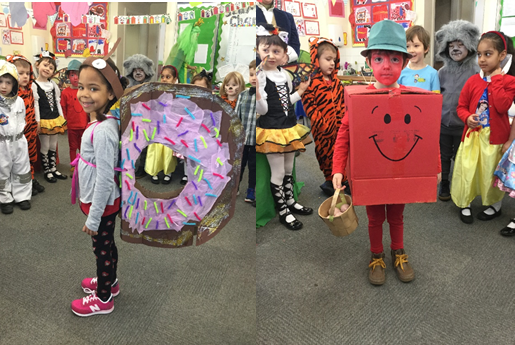 Reception loved dressing up for World Book Day this year and there were so many fantastic costumes and books.